Greater Anglia has a total fleet of 15 class 90s which are leased from Portorbrook and are numbered 90001-90015. 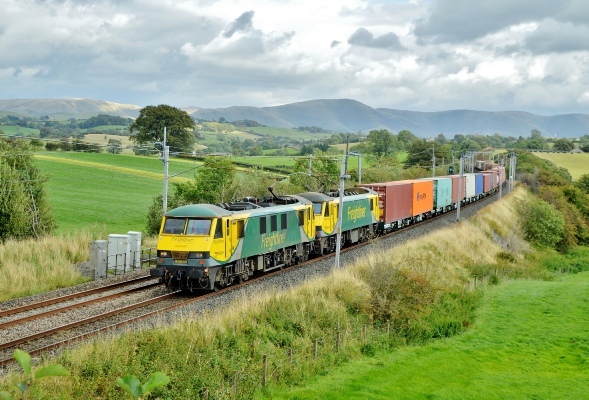 Freightliner has a total fleet of 10 class 90s which are leased from Portorbrook and include 90016 plus 90041-90049. DBC has an active fleet of 13 loco’s, which are 90018-90021, 90026, 90028, 90029, 90034-90037, 90039 & 90040. Traction availability with GA changes on a daily basis due to repairs and maintenance. There were no long-term serious stoppages at the time of writing. There is a requirement to have a maximum of 11 engines available for traffic Monday to Saturday and 6 on Sunday’s. At the time of writing, 90003 could be found out of service at Crewe TMD for remedial repairs. Also, 90004 continues to be stopped. Nothing else to report. Traction availability with Freightliner changes on a daily basis, but there is generally a requirement for 8 loco’s out of the 10 to be available at any given time. At present all members of the fleet are generally in traffic, but some will require maintenance and repairs on a regular basis as per the exam cycle. At the time of writing, there was nothing major to report for Freightliner as the fleet is going through a reliable period. 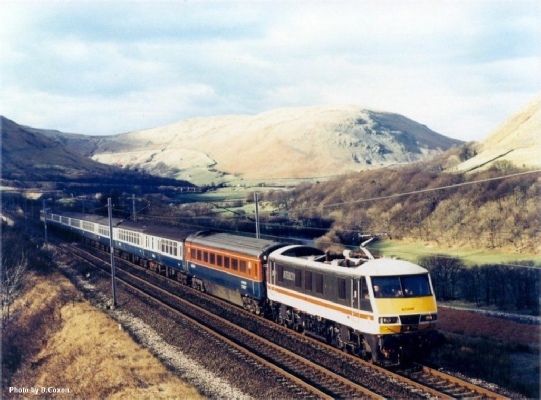 Traction availability with DBC changes on a daily basis, but they need to have a minimum amount in traffic to cover the small number of sleeper diagrams as well as freight services which are now booked to be class 90s. A handful of loco’s will always be out of traffic at Crewe for routine maintenance. At the time of writing, there were a handful of DB90s out of service at Crewe, which included 90021, 90024 and 90026. Nothing else to report. There are several class 90s in store and these can all be found at Crewe - If you require further details including reasons and associated store date, then click here. 90017, 90022, 90023, 90025, 90027, 90030, 90031, 90032, 90033, 90038, & 90050. 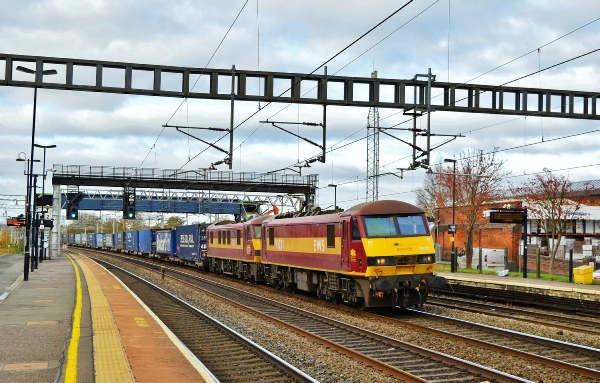 It is unclear if any of the above will ever return to traffic - It has been suggested that most of those stored at Crewe are in reasonably good condition despite being left out in the open for many years. Finally, In November 2014, 90050 was purchased by Freightliner and she is currently being used as a donor for other active fleet members in Basford Hall yard. If you require more information concerning 90050, this can be found here. Although not directly related to the long term store pool, 90020; 90021 and 90026 can be found in the WQAA pool at Crewe IEMD pending heavy maintenance repairs and attention. 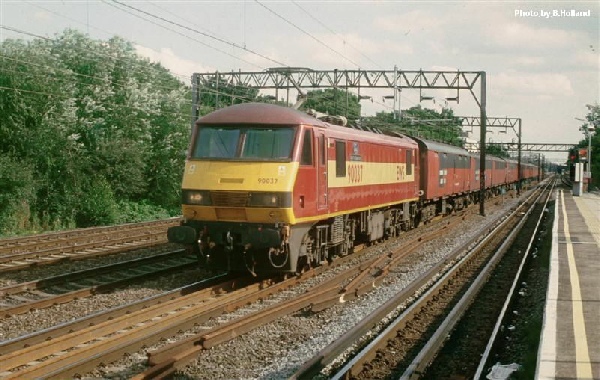 There are 50 class 90s and I am pleased to report that their were 39 operational engines each split between Freightliner, Greater Anglia and DBC (see below for more information). There are 11 class 90s in store of which 11 of these are owned outright by DBC and can be found at Crewe IEMD. The other loco (90050) was brought by Freightliner in December 2014 and is currently at Basford Hall Yard where she is donating parts to other 90s. Which 90s are out of traffic? Further information regarding exactly which class 90s are stored and serviceable in addition to why certain fleet members have been in long-term store at Crewe IEMD can be found below. If you have any questions, get in touch.